How are the New Year’s Resolutions going? I can’t even remember what mine were and it’s only just the end of February! If you’re still on a health kick, nice work! Whether you’re doing it to shed a few seasonal pounds, avoid foods which aggravate your system or alleviate an underlying health issue it’s always difficult to break old habits and stick to new ones. In this blog post I wanted to write a recipe for some of my favourite people who are on a strict plant-based and whole-food diet. 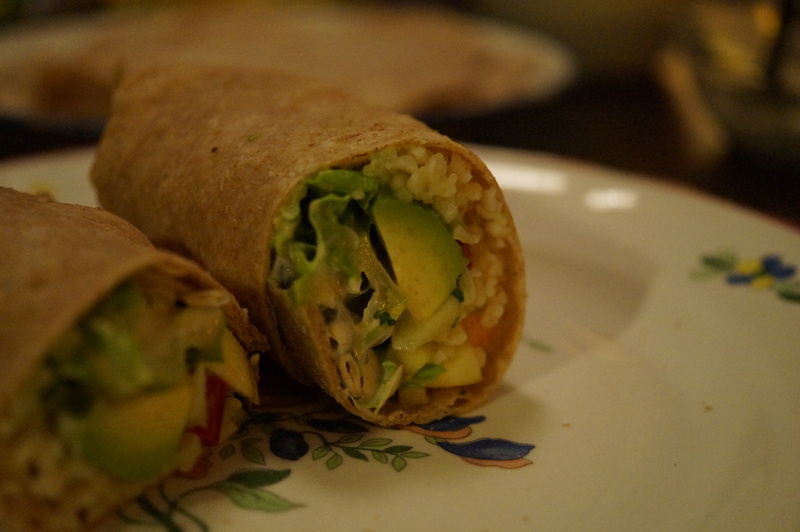 The recipe I’ve chosen is for bulgur wheat and salsa wraps which really super easy are great for sharing. 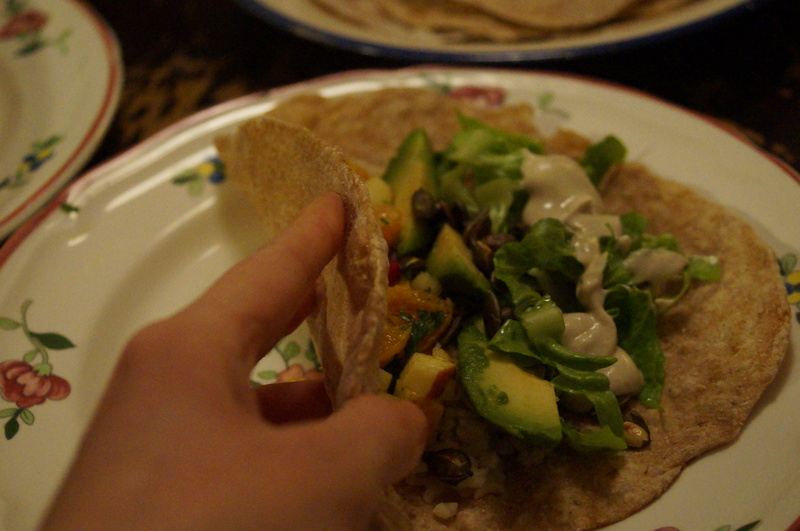 They’re based on fajitas but instead of sour cream I’ve used tahini sauce and instead of cheese there are tasty toasted pumpkin seeds. 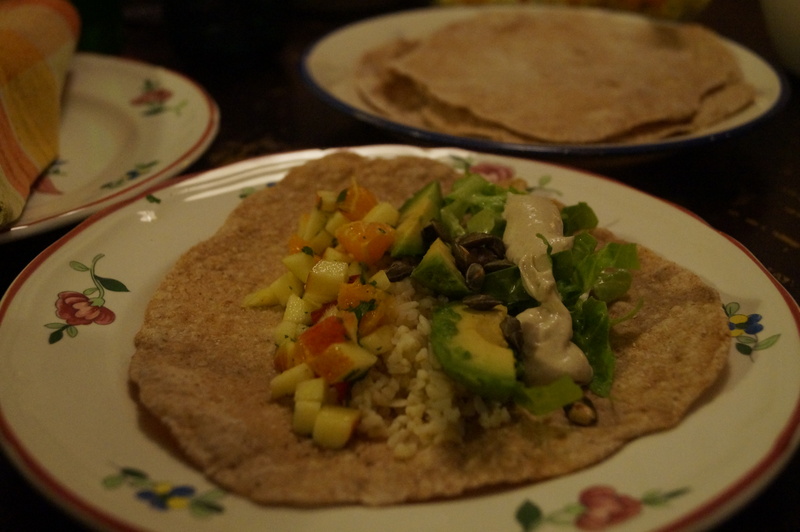 Use shop bought whole wheat tortillas or make them yourself from whole grain spelt flour. The process of piling in as much of each of the fillings as you like is fun and I hope feels more like a treat and less like a diet food. 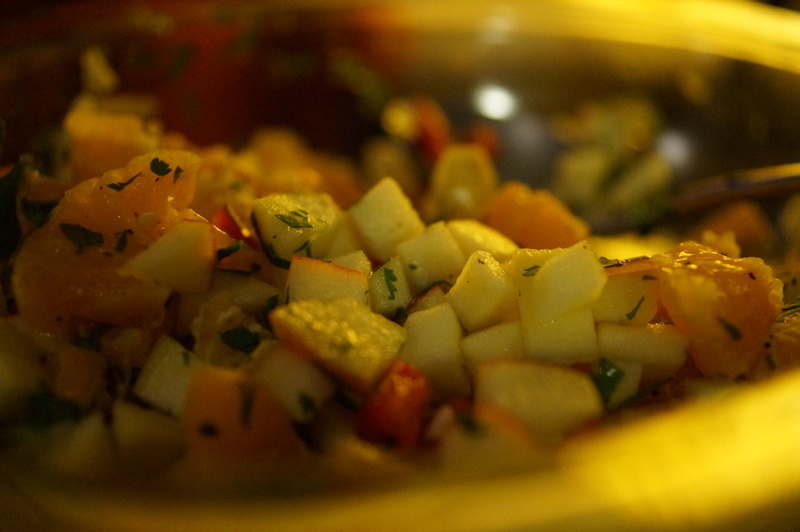 1) Finely chop the chili, apple, tangerines and coriander and put everything into a large bowl or serving dish. 2) Pour over the lemon juice and season well with salt and pepper. 3) Stir well and put into the fridge until you’re ready to serve. 4) Put 1 cup of bulgur in a heatproof bowl. 6) Mix the tahini and water together until the mixture is the consistency of thick cream. Add the cumin and stir well, add a splash more water if needed. 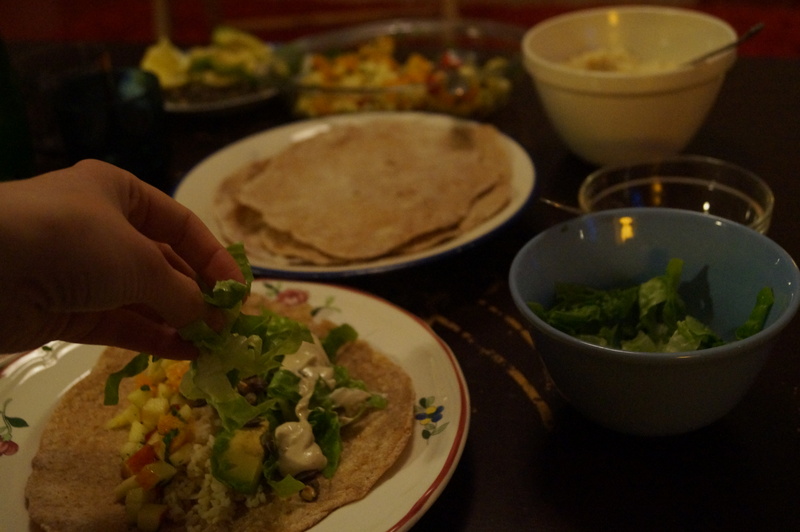 7) Load up your own wraps and dig in! Desserts are often off the menu when you’re trying to stick to a healthy plan, but I’d find them super hard to give up entirely. My favourite discovery is this banana ice cream, it’s made with blended, frozen bananas and that’s it! Genius! It really does end up like a premium ice cream but with the calorie count of, well…a banana! And it doesn’t end there. Missing pastry? Try using ripe avocado instead of butter in your shortcrust recipes. Ok, so it doesn’t come out as crisp and rich but it’s not half bad. I made a sweet potato pie with avocado pastry recently and served it with banana ice cream and a cheeky drizzle of maple syrup! Yummers! I would absolutely love to hear from you about healthy eating and special diets. What foods are you currently avoiding? Send me a message in the comments box or via the contact page and I may be able to write a brand new recipe for you too.